On this date in 1939 in Poland, Luftwaffe chief Her­mann Goering pre­pared to send hun­dreds of air­craft to blitz War­saw in the first major city attack of World War II, while Ger­man armored forces pre­pared for a ground assault on the Polish capital. At 8 a.m. the next day, known as “Black Mon­day” in Poland, Ger­man air­planes, including some that were obso­lete, con­ducted 1,150 sorties over the city, drop­ping 500 tons of high-explo­sive bombs and 72 tons of incen­di­ary bombs. In doing so, Ger­many intro­duced the con­cept of fire­bombing civil­ian popu­la­tions. The bombing ruptured water pipes and pre­vented the in­fer­no from being quenched. Between aerial and artil­lery bom­bard­ments, 40 per­cent of War­saw’s buildings were damaged and 10 per­cent de­stroyed. Over 75,000 civil­ians became casu­al­ties before the capi­tal sur­rendered on Septem­ber 27, 1939. The Ger­mans took over 100,000 pri­soners. The Luft­waffe next fire­bombed Rotter­dam in the Nether­lands, this on May 14, 1940, killing 1,000 resi­dents and leaving 78,000 home­less, even though the Dutch city had already capit­u­lated. Ger­many carried out fire­bombing raids on an ever larger scale with night­time attacks on the Mid­lands city of Coventry and the British capi­tal, London, in 1940–1941 (Blitz). Incen­di­ary bombing of hea­vily popu­lated Euro­pean cities was ratcheted up again when the Allies vir­tually de­stroyed the north Ger­man city of Ham­burg in mid-1943 in raids that killed about 50,000 peo­ple. The Ham­burg “area bombing,” or carpet bombing, was a delib­er­ate attack on civil­ian morale and did little to damage the Nazis’ war machine in con­trast to Amer­ica’s “pre­ci­sion bombing” of Ger­man mili­tary and indus­trial tar­gets such as air­plane, ship­building, and synthe­tic oil refin­eries, which inflicted major dis­rup­tions on the Ger­man mili­tary and eco­nomy with fewer civil­ian casu­al­ties. Three months before Ger­many’s sur­render in May 1945, 1,300 U.S. and Brit­ish heavy bombers un­leashed 4,000 tons of bombs on Dres­den, de­stroying 15 square miles of that his­toric city in a con­fla­gra­tion that killed some 25,000 peo­ple. Half a world away, Japan’s capi­tal, Tokyo, was the worst-ravaged of any fire­bombed city when on March 9–10, 1945, 90,000 civil­ians were killed out­right and 40,000 later died when U.S. napalm-filled “block burners” spread a fire typhoon through the city. Left: Burning Warsaw, September 1939. The Luftwaffe opened the Ger­man attack on Poland’s capi­tal on Septem­ber 1, 1939. 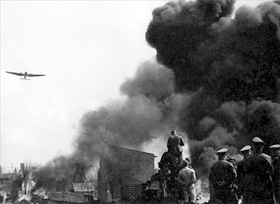 As Ger­man armored units approached War­saw on Septem­ber 8, Junkers Ju‑87 Stukas and other bombers attacked the city. On the 13th, Luft­waffe bombers caused wide­spread fires. 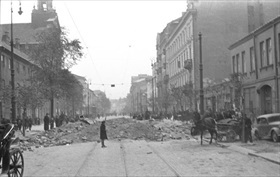 On Septem­ber 25 Luft­waffe bombers, in coor­di­na­tion with heavy artil­lery shelling, dropped close to 600 high-explo­sive and incen­di­ary bombs that badly damaged Warsaw’s city center. Right: Under aerial cover German forces entered War­saw on Septem­ber 27, 1939, after three key forts in the city defenses were cap­tured and the Polish gar­ri­son sur­rendered. After the capitu­la­tion approximately 5,000 offi­cers and 97,000 sol­diers and NCOs were taken into cap­tivity, many never to be seen again. 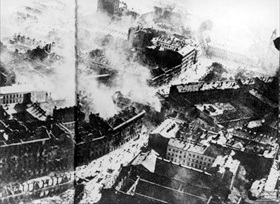 Left: From the first hours of the war, Warsaw was the target of an un­re­stricted aerial bom­bard­ment cam­paign, and the Luft­waffe used all avail­able air­craft in its inven­tory. Apart from the mili­tary facili­ties such as infan­try bar­racks, the air­port, and an air­craft fac­tory, Ger­man pilots also tar­geted civil­ian facili­ties such as water works, hos­pitals, mar­ket places, and schools in an effort to ter­rorize the city’s defenders into sur­rendering. In this photo a nine-year-old boy takes time out from a search for food for his family. His father, later taken away by the Nazis, never returned. Right: Between air and ground assaults in Septem­ber 1939, War­saw suf­fered 25,800 civilian deaths, while approxi­mately 50,000 were wounded. Forty per­cent of the city’s buildings were damaged and 10 per­cent destroyed. The Polish Army lost approxi­mately 6,000 killed in action and 16,000 wounded in what Poles call the Polish Defen­sive War of 1939. Ger­man casu­al­ties are esti­mated at 1,500 dead and 5,000 wounded. 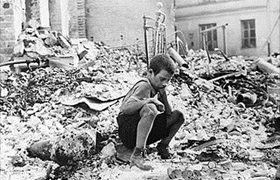 In the course of the nearly six-year-long conflict in Poland close to 85 percent of the Polish capi­tal was destroyed, in part due to mass aerial bombings and heavy artil­lery fire by opposing Ger­man and Soviet forces in 1944–1945, and the demoli­tion cam­paign by venge­ful Ger­mans against city’s inhabi­tants who had staged an unsuc­cess­ful up­rising between August and the first three days of October 1944.